As a teenager I was plagued with low back problems due to many injuries. Like many people I tried the treatment of heat, muscle relaxants and rest that was popular at that time. After years of struggles came across a chiropractor and realized my pain was due to the fact that my spine did not function correctly and never had a chance to heal properly. To my surprise with only a couple of Chiropractic adjustments most of my pain was gone and I felt great. This led me into looking into chiropractic as a career and the rest is history. I soon finished classes at Central Michigan University and then attended Palmer College of Chiropractic until graduation in 1993. I have since owned and operated successful practices in both Michigan and Everett Washington. I am the father of two great young adults and personally enjoy all outdoor activities such as snow skiing, hiking, kayaking, fishing, hunting and horse riding. (Well my kids ride, I do not.) I am active in general weight lifting and physical fittness. I know I need to stay in shape in order to help others stay in good health or get back to good health! In the practice I treat many type of spinal issues and back pain such as whiplash, headaches, neck pain, low back pain, sciatica and shoulder injuries to name a few. I have had a special interest in low back pain and disc herniation due to my own low back issues. Along with seeing my father suffer with back pain and then have three low back surgeries. In regard to whiplash I have had the opportunity to be involved in many post graduate seminars in whiplash and have treated thousands of victims of whiplash type injuries. 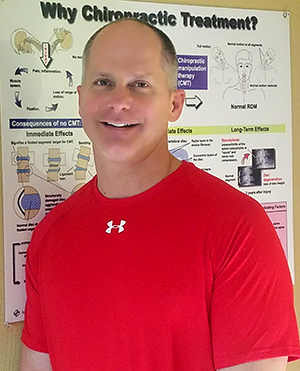 In Everett I have had the opportunity to develop relationships with orthopedic surgeons at both Everett Bone and Joint, and the Everett Clinic, therefore, if I cannot get you out of pain quickly or if it appears you need medical care I can refer to one of these clinics quickly. Please take some time and peruse our web site, and if you have any questions do not hesitate to call and make an appointment for a no charge consultation.